Intense Polish Therapy: Canvas Lacquer - in the City Collection Swatches! 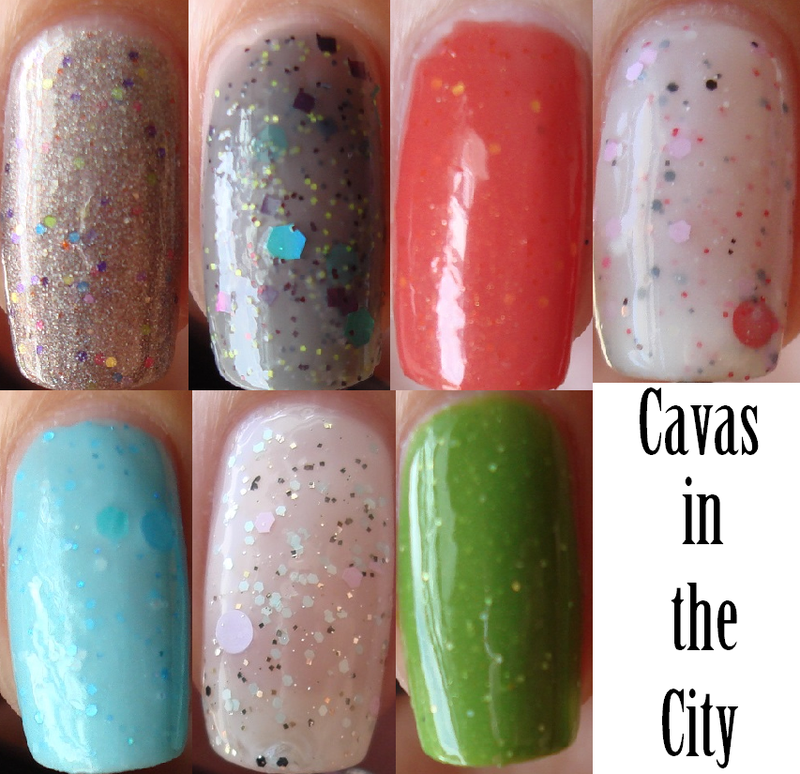 Canvas Lacquer - in the City Collection Swatches! Hey guys! Today I have swatches of an amazing collection that I really enjoy for the fact that it really shows not only it's love for a Canadian city but the capital of Ontario. So I am more than happy to share my swatches of the Canvas in the City Collection inspired by Toronto! "A light grey jelly base with a mix is neon yellow micro glitter, burgundy micro glitter, wine squares and holographic green hexes." "A bright and juicy coral jelly with tangerine micro glitter, yellow hexes, a mix of red holo sparks and a subtle golden shimmer." "A milky blue base with fine white and blue glitters, ocean green hexes, baby blue dots, fine green holographic sparks, and a subtle minty shimmer." "A beautiful glitter topper with mint, pink and black hexes, lavender dots and fine gold in a clear base." "A milky white base with red dots, matte white and pink hex, iridescent hex, hot pink microglitter and a sprinkling of deep cherrywood hex in different sizes." "A grassy green crelly base, fine silver holographic glitters and a hint of holographic shimmer." "A unique silvery gold holographic base with hints of pink flash, with a gorgeous mix of neon matte glitters in pink, green, blue and purple." Follow & check out their blog! As well as follow them on twitter!